Note: This is the first article of a three-part series covering plastics in barrier packaging (1) trends, (2) material/process advances and (3) applications. Food and beverage packaging together comprise 55 percent of the $550 billion value of packaging in the global marketplace. Food processing and packaging industries spend an estimated 15 percent of the total variable costs on packaging materials. The continued quest for innovation in food and beverage packaging is mostly driven by consumer needs and demands, influenced by changing global trends — increased life expectancy, fewer organizations investing in food production and distribution, and regionally-abundant and diverse food supplies. The food industry has seen great advances in the packaging sector since its inception in the late 19th century, with most active and intelligent innovations occurring during the past century. These advances have led to improved food quality and safety. While some innovations have stemmed from unexpected sources, most have been driven by changing consumer preferences. The new advances have mostly focused on barrier development advances in delaying oxidation and controlling moisture migration, microbial growth, respiration rates and volatile flavors and aromas. This focus parallels that of food packaging distribution, which has driven change in the key areas of sustainable packaging, use of the packaging value chain relationships for competitive advantage, and the evolving role of food service packaging. Nanotechnology has potential to influence the packaging sector greatly. Nanoscale innovations in the forms of pathogen detection, active packaging and barrier formation are poised to elevate food packaging to new heights. Combinations of active and barrier packaging are being used to increase shelf life, protect flavor profiles and maintain food's appearance without adding preservatives. Material developments and new packaging processes are allowing food to be kept fresh much longer without altering taste or aroma. Traditional barrier materials extend product shelf life by impeding oxygen migration into a package, but oxygen scavengers go one step further by "capturing" oxygen present within a sealed package to ensure that it does not react with the food product. The global functional additives and barrier coatings market for plastic packaging is projected to reach almost $3.7 billion by 2018. 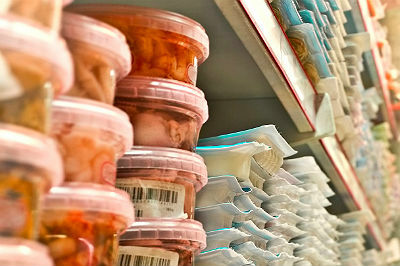 Unique food product advances are resulting from combinations of barrier technology and processing advances such as microwave pasteurization of chilled-ready meals. For example, multicompartment trays are being developed that heat foods at different rates. A microwave-shielding label molded into the vertical wall of one compartment of the tray using in-mold labeling ensures that the food in that part of the tray receives gentler treatment from the microwave than the food in the unshielded compartment. Conveni BV is launching refrigerated entrees using an injection-molded multicompartment tray that incorporates Shieltronics technology. 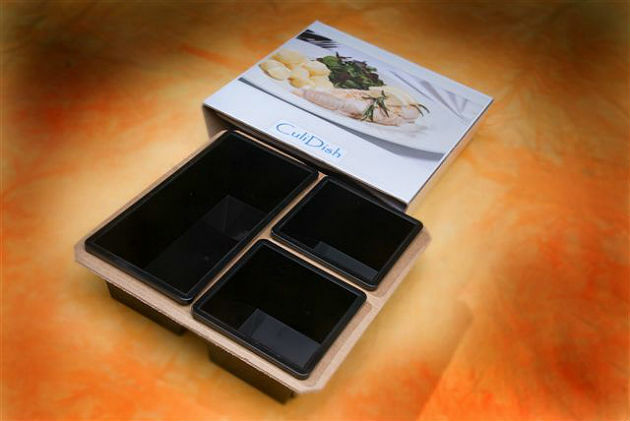 Culidish packaging with multicompartment meal components. Nanotechnology is also being used to enhance packaging barrier properties. New nano-based food packaging materials with improved mechanical, barrier and antimicrobial properties, and nanosensors for traceability and monitoring food condition during transport/storage are key development areas for nanotechnology in food packaging. Some developments are geared to improving application properties by using active substances on the nanoscale that are incorporated into packaging materials. The use of nano-based packaging for food products has raised various safety, environmental and regulatory issues. The main concerns stem from the lack of knowledge regarding long-term effects of nano-sized materials on consumer health and the environment and the lack of definition as to what constitutes a nanomaterial. New clear barrier materials are being developed to replace aluminum foil and other opaque barrier materials as part of a trend toward packaging food products in clear materials. Lightweighting of polyethylene terephthalate (PET) bottles gives rise to thinner wall thicknesses and greater permeation, adding another dimension to the barrier coating challenge. Reduction of material in blow-molded PET containers is driven both by cost reduction (material, transportation) and by consumer demand for sustainable packaging. Safety, convenience and quality are constantly driving food packaging technology. With an increasingly global food-retailing customer base, food packaging must meet longer shelf-life requirements and adherence to international food safety/quality standards. Increasing demand for fresh and quality packaged food, consumer convenience and manufacturers' concern for longer shelf life of the food products is driving the market for global advanced packaging technology for the food and beverage market. Growing demand for convenience foods and "ready meals" created by busier lifestyles and increased disposable income are reflected in high growth in food packaging. Changing global demographics, lifestyles and consumer preferences mean global demand for food packaging — estimated to be $130 billion for 2014 — is expected to experience an AAGR of 3.8 percent over the next five years. Of this global food-packaging market, the global active, intelligent and smart food and drink packaging market reached $12.7 billion last year. 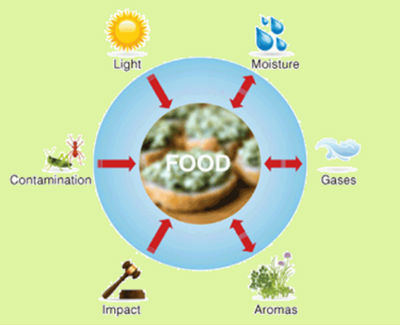 External factors affecting food product packaging. In addition to product protection from packaging, consumers want to see the food they buy; they want it to stay fresh for a longer period; they want it to be safe to eat; and above all, they want it to be tasty. Number one with the public is food safety, and active or barrier packaging that can help prevent spoilage or contamination is in strong demand. This not only extends shelf life, but it also protects brand image. Recalls can be particularly damaging to brand image and the food company's bottom line. Consumers want easy-to-open, see-through, economic packaging that also protects against oxygen, water vapor and aromas. Nanotechnology is enabling new food and beverage packaging technologies to address the needs for longer shelf life and the ability to monitor food safety and quality based upon international standards. Government policy and regulations are also impacting barrier plastic packaging design. 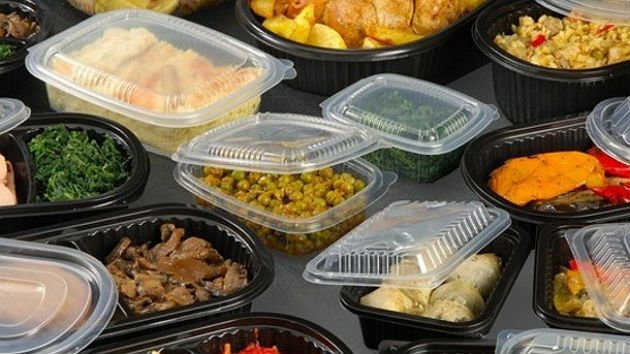 The use of nano-based packaging for food products has raised various safety, environmental and regulatory issues with the European Food Safety Authority (EFSA) and the Food and Drug Administration in the U.S.
Packaging waste is a growing environmental concern, and consumers are seeking more sustainable packaging choices driving food packagers to look for bioplastic materials with good barrier properties. The presence of oxygen-sensitive unsaturated fats are also fueling development of active and barrier packaging in flexible and rigid formats. This results from the trend toward natural/organic foods featuring heart-healthy fats. Dr. Donald V. "Don" Rosato serves as president of PlastiSource, Inc. a prototype manufacturing, technology development and marketing advisory firm located in Concord, Massachusetts. He has written extensively, developed numerous patents within the polymer-related industries and is the author of the Vols. 1 & 2 "Plastics Technology Handbook".